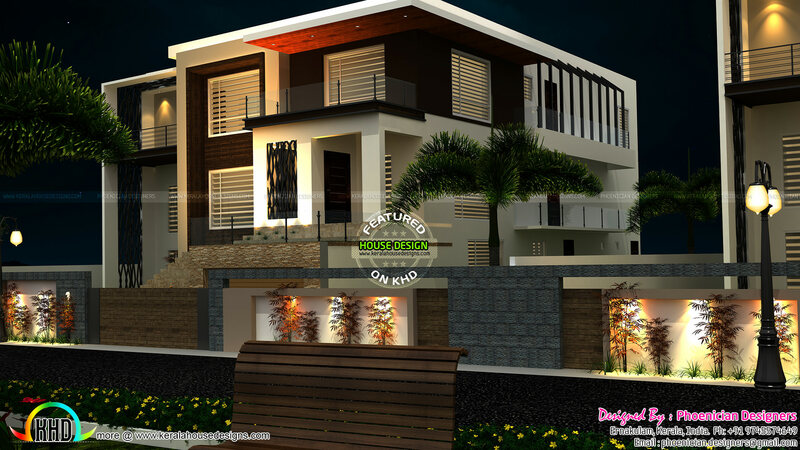 Introducing a new architectural firm to KHD fans, Phoenician Designers from Ernakulam, Kerala. Showcasing a beautiful modern villa in an area of 6000 Square Feet (557 Square Meter) (667 Square Yards). This house offers beautiful spaces, grand volumes, with a unique patio terrace that takes full advantages of the beauty of the site. Phoenician designers created the typical split of sleeping versus living area, leaving the private sleeping rooms on the upper level while the living room area covers the first level. The master suite features a modern walk-in wardrobe and a Mediterranean-styled private bathroom. A large living and dining room with chimney and an open modern kitchen complete the property. The quality and luxurious finish of materials used, perforated metallic windows and its translucent and brilliant airy effect all contribute to an outstanding sense of well-being and high level of relaxation. Basement with closed garage with two car parking and an attached tools room , store room. Also with office room, gym with toilet, servants and drivers rooms with attached toilets, and a spacious lobby with a stair leading to ground floor work area. Ground floor including foyer, formal living, family living, a small bar counter, prayer area, dining room, patio, open kitchen,second kitchen work area and big bedroom with attached toilet & walking closet. First floor including, 4 bedrooms with attached toilets & walking closet, three balconies, library, living room, home theatre etc. 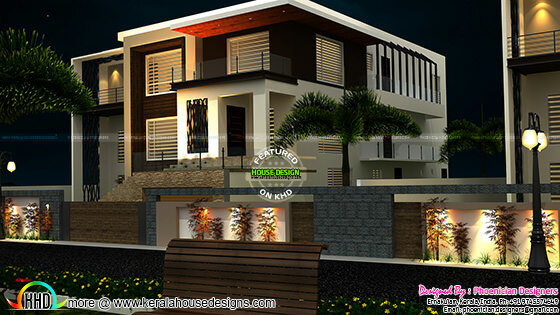 0 comments on "Modern house plan by Phoenician Designers"